Design Burd Inc.Bio Nutrition Inc | Design Burd Inc. Pain staking research and the finest raw materials go into the development of each and every product. With a superior research and development team Bio Nutrition Inc. looks forward to providing a wide variety of the most innovative, cutting edge supplements available. 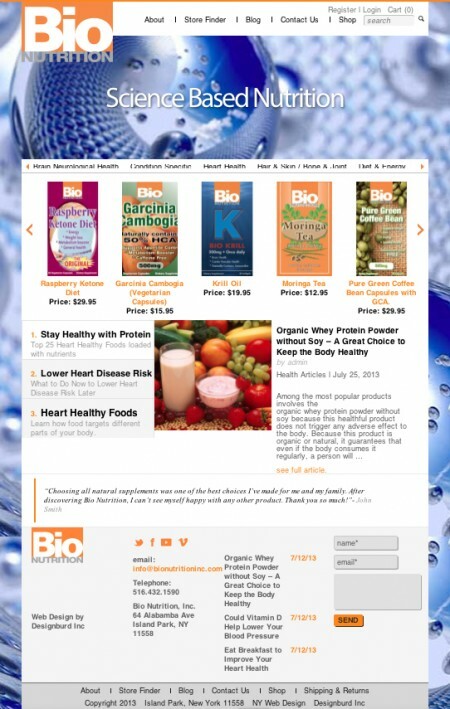 Bio Nutritionâ€™s wellness products are a uniquely formulated science based dietary supplement line, designed to address the most common maladies effecting society today. We use the highest quality raw materials in each product; including wild crafted or organic herbs and extracts, whole foods, vitamins, minerals and co-factor sourced domestically in the U.S.A. whenever possible.